Patient literacy, privacy, and cultural issues. The highest incidence of cervical cancer was in Africa and Latin America and Caribbean and the lowest incidence in Northern America and Oceania. There is progress in LICs such as Ethiopia, that are developing national initiatives to overcome infrastructure and policy-based barriers to improve the outcomes of the preventable spread and prognosis of cervical cancer, with revitalized public health efforts. In spite of Ethiopia's health care infrastructure constraints, its Ministry of Health is shaping a progressive approach to addressing health disparities by embracing mobile health technology, as an extension of their eHealth strategy to address these gaps in care. Ethiopia has an estimated 7000 new cases of cervical cancer each year, and nearly 5000 deaths from cervical cancer yearly. This data is collected primarily from those who present to Addis Ababa for treatment, as currently Addis Ababa is the only oncology treatment center in the country with radiation capacity. The number of women with cervical cancer identified in Addis Ababa was inversely related to the distance the woman lived from the capital (Abate, 2015). Women at risk for the development of cervical cancer are primarily those without access to screening and preventive measures. In Ethiopia, 0.8% of the eligible population have ever been screened for cervical cancer. Further risk factors relevant in the Ethiopian region include exposure to chronic smoke inhalation, as Edelstein et al. 2008 reported 80% of the rural women in the Gondar region have exposure to chronic smoke inhalation with poor ventilation due to cooking practices. High-fertility increases the cervical cancer risk, as does young age at first pregnancy. According to the Ethiopia's Demographic and Health Survey (EDHS), the fertility of Ethiopian women is 4.8 children per woman, with more children born in rural areas per woman than urban. In addition, the median age of first birth in Ethiopia ranges from 18.1 in Amhara to 23 years old in Addis Ababa. In sum, there are significant risk factors for cervical cancer in Ethiopia, an already apparently high incidence, and yet missing data. The National Reproductive health strategy of federal democratic republic of Ethiopia emphasized the need to address noncommunicable disease, especially gynecologic cancers, including cervical cancer, as top priority focus. Furthermore, in Ethiopia's Growth and Transformation plan II, the country intends to incorporate visual inspection with acetic acid (VIA) and cryotherapy at 100% of its hospitals. This decision is based from the WHO recommendations. Additional strides are made to consider the incorporation of human papillomavirus (HPV) screening into the system, though these are not yet out of the research phase. In 2010, Ethiopia's Ministry of Finance and Economic Development provided financial support for the development of five oncology centers, each will start providing holistic cervical cancer treatment and rehabilitation service. Among the five hospitals, University of Gondar comprehensive and specialized hospital is selected as an oncology center for Amhara region. The University of Gondar currently provides screening and treatment for precancerous lesion of the cervix using VIA and cryotherapy and loop electrosurgical excision procedure, respectively. It is the only hospital in the Amhara region where treatment for cervical cancer exists including radical hysterectomy, a well-established chemotherapy center, and a fellowship program on gynecology oncology. Importantly, the Institute of Public Health at the University of Gondar has strong research team, Health Demographic Surveillance at both the rural and urban population level, and strong research collaboration with obstetrics and gynecology department. Despite the political will to have an effective cervical cancer screening and prevention program, there are seven significant barriers that prohibit the support of a sustainable health IT infrastructure for national public health initiatives. According to 2016 (EDHS), 20.8% of the population (93% of urban households and 8% of rural households) have access to electricity. In rural areas, very few Kebele (the lowest administrative unit)-level facilities, including health posts (HPs), have electricity, limiting the ability to recharge mobile phones. About 5% of HPs access to electric power. About 90% of health extension workers (HEWs) [HEWs are locally based health care workers, sponsored by the FMOH, that are specifically trained to provide basic, primary and preventive health care services at household levels, and clinical referral support for patients in low resource regions across Ethiopia.] have mobile phone. Unfortunately, only 23% of them have consistent access to charging stations. Interruption of electric power to these facilities can last from a few hours to days; mainly for smart phones with battery lifetime got shorter when Internet connection, Global positioning system (GPS), and Bluetooth functions used simultaneously. In the early age of mHealth adoption within Ethiopia, retaining experienced professionals in the field has been challenging. The HEWs are the front-line workers in the country's health system and generally have 1 year basic in-school training. HEWs make up 47% of the country's health workforce with approximately 38,000 (two for every 600 households) across Ethiopia. HEWs are severally resource constrained as it pertains to labor intensive health information tasks associated with patient engagement. They are expected to record both the existing paper-based data collection efforts in addition to performing electronic data entry to support this dual system of medical record management. This is compounded with limited access to health IT and keyboard training, to address gaps in health IT literacy for HEWs. These factors directly contribute to the attrition challenges Ethiopia faces for new ICT initiatives for public health. To assess the impact of these constraints on mHealth initiatives, the Federal Ministry of Health (FMOH) sponsored a research study to evaluate the performance impacts of mHealth programs on HEWs. The study found that 78.3% of HEWs mentioned time-consuming nature of both manual and electronic mHealth recording as a reason for stopping to use electronic forms.,, According to the study, HEWs had poor English proficiency and usually preferred local language, although the working language in the Ethiopian health system is English.,, This clearly highlighted the need for mHealth solutions to support local languages and dialects for optimal use. Finally, one focus area was to report its findings on the use of mHealth solutions by HEWs and the impact on patient care based on their employment status and availability. They observed inconsistency in the use of mobile solution due to an inability to backfill gaps in HEW coverage or when workers left a care program or were unavailable due to personal commitments or conflicting work assignments.,, For example, the report highlighted within the 6-month period of the study, 82.6% health workers had been away from their health facility at least once for attending training outside of their working station. In Ethiopia, health information systems designed to collect data are required to align with the processes, goals, and objectives of the national Health Management Information System (HMIS). Unfortunately, there is no centralized enterprise architecture governance body or regulatory system that verifies compliance to HMIS interoperability standards of new electronic health systems from the inception to end. This creates significant gaps in system-level integration and data exchange protocols between systems, which create poor access to patient and population-level data. As a result, there is a great need within Ethiopia for a common health data governance model and technical reference architecture that supports national policies and business rules associated with health information management, data stewardship accountability for key stakeholders, and system-to-system interoperability for reliable data exchange,. For a common mHealth strategy to be sustainable across Ethiopia, will require strategic, integrated national efforts based on common goals.,, A committed partnership between the government, local authorities, health-care systems, universities, private sector and donors is essential in the planning phase to identify common goals. Coordination between Ethiopia's ministries, national authorities, academia, health-care providers, and private business are a prerequisite for success. It is particularly important to ensure consensus between the Ministry of Health and Ministry of IT and Telecoms ,, or Ethiopia will not be able to achieve sustainable success for their mHealth strategy. Ethiopia dedicated 10% of the Gross Domestic Product to telecommunications investments and retains an extensive mixed-capability ICT infrastructure that provides a blended coverage of 85% of the country's population. However, the mobile subscription rate of Ethiopia was 8%, which was 4–6 times lower than Kenya (51%), Uganda (30%), Tanzania (31%), and Rwanda (36%). According to EDHS 2016, overall 56% households have access to mobile phone; 88% of urban households and 47% of rural households own a mobile phone. About 27% of women and 55% of men owned mobile phones at the time of the survey. About 71% of urban women own a mobile phone, compared with 15% of rural women. Ethiopia uses Global System for Mobile communication and Code Division Multiple Access (2G and 2.5G/GPRS) mobile and fiber technologies. Over 500 cities have related to fiber up to 2Mbps connectivity. Overall, only 4% of women and 12% of men age 15–49 have used the Internet in the past 12 months in Ethiopia. Airtime (voice, SMS, and data use) costs are one of the most significant cost categories associated with any mHealth deployment. Anticipating costs requires creating mHealth capacity models that can predict the airtime associated with any application, which would require adjustable volume procurement rates with Ethio Telecom, Ethiopia's primary telecom supplier. From a regional cost perspective, a prepaid air time for voice call per minute costs in $.06 Ethiopia, in $.04 Kenya, in $.06 Uganda, $.04 in Tanzania, and $.07 in Rwanda. Whereas SMS per unit costs in $.02 in Ethiopia, Kenya, and Uganda which is lower than $.03 in Tanzania and $.04 in Rwanda. Interviews conducted during this study indicate that they typically spend 10-20% of their monthly income on airtime, 50% of which was used for work-related calls and messaging. While device costs constitute a smaller percentage of project costs than is often assumed, the cost of acquiring (and replacing) devices on a large scale is considerable. As with airtime, negotiating lower prices or volume discounts with providers can reduce costs. A price for basic handset was $24.24 in Ethiopia, $12.12 in Kenya, and $14.54 in Tanzania. In the Ethiopian health system, Health Information Technicians (HITs) there are specific levels of knowledge and required skill sets for specific care settings, from health centers to hospitals and health administrations, to meet critical health information efforts. However, there is a persistent shortage of HITs, health informatics professionals, and health IT postsecondary and graduate-level students to support very complex health information management efforts, which slows the progress of adoption of new mHealth or related ICT solutions. Despite these barriers, there is still great potential for national adoption of mHealth capabilities across Ethiopia. 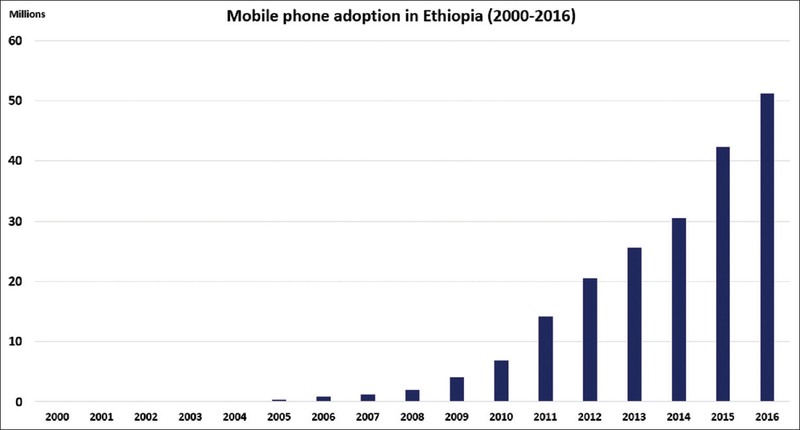 The mobile penetration in Ethiopia has been growing exponentially. In 2016, the number of mobile subscriptions was at 51.22 million which doubled by half in short periods since 2013 [Figure 1]. It is planned that in 2020, mobile service subscription will reach 103.7 million and that of Internet and fixed line will be 56 million and 10 million, respectively. The Ethiopian Government has been increasing their investment additional human resources in ICT to support its expanding communications network. The Government of Ethiopia has made the development of information and communications technology as one of its strategic plan priorities and has been investing in communications infrastructure to offset low communications penetration, especially in rural areas. 90% of Ethiopia's geographic area have access to mobile service. The mobile network coverage comprises 3G and 2G services and 4G LTE technology deployment. Over 500 cities have been connected to fixed-line Internet and every regional capital has fiber connectivity with up to 2Mbps connectivity. In terms of electricity, the national power provider EEPCo has accelerated its progress in connecting towns and cities to the national grid infrastructure. Reach at least 80% coverage of the appropriate target populations with screening and treatment for preinvasive cervical-cancer cases. The national momentum within Ethiopia for health IT adoption provides a fertile ground to lay the foundation for a sustainable mHealth architecture that can be incrementally adopted across care settings. Ethiopia's health-care system can position them as a country to embrace the value of Open Source technology and Open Science frameworks for a financially sustainable and technically reliable mHealth infrastructure. The movement toward Open Source-Open Science solutions is evident with the new e-health platforms that are taking shape to address these challenges. As the Global Health community enters into a broader range of eHealth adoption efforts, we see pioneering growth and expansion of mHealth solutions that are taking a progressive approach to enabling more effective patient engagement and peer-to-peer clinical decision support at the point of care. This has also led to supporting new patient engagement research models for public health biosurveillance and education efforts related to infectious disease prevention and control and medication adherence in LICs worldwide. As a result, some mHealth initiatives have moved the needle with the adoption of new patient engagement efforts, simply due to leveraging this new technology. The goal of an integrated Open Source-Open Science platform is to take mHealth one step further, by enabling reusable clinical intelligence that can be shared and redistributed in the context of clinical innovation before, during and after care is delivered. As a result, mHealth becomes an essential building block to this framework, by providing a timely data and clinical intelligence for prevention, treatment, and clinical innovation efforts. When mHealth is coupled with an Open Source-Open Science virtual collaboration environment, it will enable LIC care teams and research scientists to engage more effectively, in interactive population health initiatives and global knowledge sharing that contributes to improved outcomes in care and clinical innovation. Our research team has developed a conceptual mHealth architecture model and Open Source technology platform to address the barriers and opportunities presented in this paper, for a method of introducing sustainable mHealth architecture within Ethiopia. The scope of our proposed pilot is to test and validate our hypothesis that the platform can support the NCCP strategies for cervical cancer as a point of validation to provide a scalable solution that can grow at the pace of technology adoption that aligns to their national eHealth strategy. Our specific aim is to partner with the University of Gondar's Institute of Public Health and the University of Gondar's School of Medicine and Health Sciences, to configure and test our mHealth screening application and platform with local health care providers and regional health centers within the Amhara Region, in support of the NCCP cervical cancer strategic goals and objectives. Our initial focus is to support their goal to provide cervical cancer screening using VIA for all women aged 30–49, every 5 years. Improve evaluation of cervical cancer control intervention activities. The National Criminal Justice-Drug Abuse Treatment Studies– NIH. Operational engagement – This domain consists of the identification of service-level and key performance indicators, knowledge management, and delivery system optimization efforts after the launch of their medical innovation. 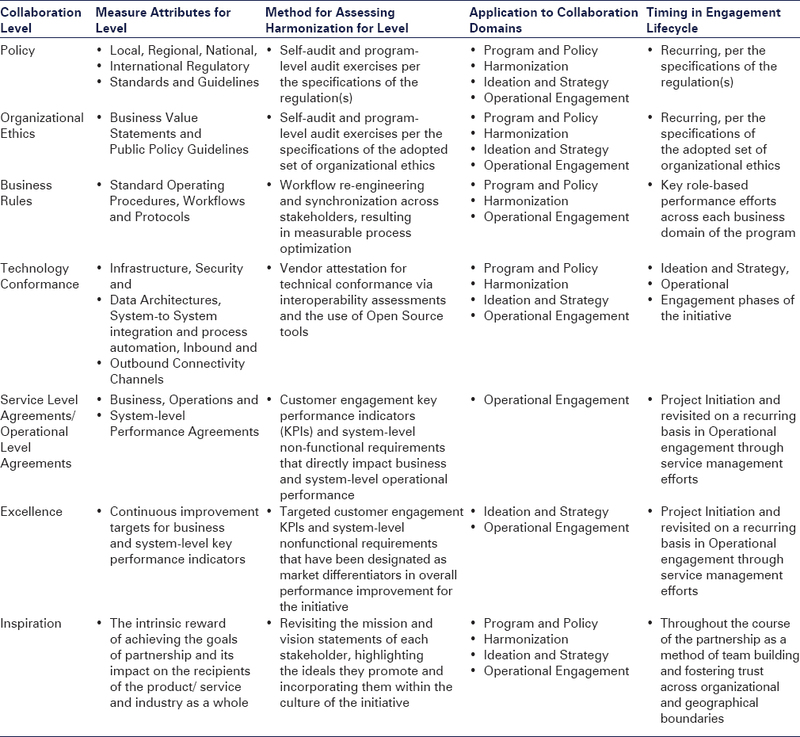 [Table 1] outlines the scope of the model that can be tailored based on the goals and objectives of the organization and their collaborative partnerships. Verify reliability of business continuity and disaster recovery strategies that would impact access to the platform to prevent avoidable data loss due to unplanned telecommunication and electricity outages. The configuration of the telecommunication infrastructure will be designed and tested to send patient engagement alerts via text, video, static and dynamic images, and audio messages from the care team to the patient, that align to evidenced-based protocols supported by the NCCP and the WHO guidelines for cervical cancer. This pilot will be designed to test a set of open source unified communication tools that are optimized for both mHealth and telehealth in high and low-bandwidth areas, using current industry standards for unified communications and health interoperability standards.,,,,,,, This data will include telemetry or other portable medical device, text, audio files and any other patient information that is available for electronic capture. The system will be scalable to support near real time communications in areas where network access is available and reliable, and to store the information for future transmission when it is not, in offline mode. All communications would be GPS location tagged with the location stored in a database. The location data would be acquired using standard cellular GPS tracking data which would be able to provide health-care provider location information, even when the health care provider is not aware of his or her location. These event messages will be launched from preapproved, authenticated sites utilizing the same basic processes and protocols that are used today in the United States to launch Amber and Silver Alerts over the Individual Personal Alert Warning System.,,,,,,, A full suite of Unified Communications tools, including instant messaging and presence, would be embedded in the application. These tools would use recursive messaging systems in which the device selects the best means of conveying the information depending on network conditions and capabilities. If no reasonable method is available, the application stores the message for automatic delivery once a network link is re-established. The location tagging would occur at the time of the message initiation regardless of when or from where the message is eventually sent. The applications needed to support these tools can be developed for Windows, IOS and Android operating systems. The system would also be designed to be able to support emergency alert messages to targeted individuals, if mass notification is required due to an emergency event. We will tailor the implementation approach for the mHealth platform, from best practices for LIC mHealth deployment from our research team member and LIC mHealth specialist, Dr. Shashank Garg, who developed the HANDSREL's mCollect Electronic Data Capture Platform. Dr. Garg's platform was designed to address a similar challenge for high risk TB patients for one of India's national TB initiatives. A recent mHealth implementation achievement by Dr. Garg, was a comprehensive data management solution they developed for the Public Health Foundation of India Safe Childbirth Checklist Evaluation Study (involving data collection and management of over 300,000 retrospective records from Labor Rooms in 13 districts of Rajasthan State over a 2-year period. Dr. Garg and his research team utilized the Unified Theory of Acceptance and Use of Technology (UTAUT) model, developed to investigate the antecedents and challenges in the adoption and use of the mobile-based IT solution., His mHealth study for TB surveillance contributed to the UTAUT literature and expanded the understanding of the implementation of IT solutions in a public healthcare service delivery context. In addition, it provided measurable insight to determining the influence of four independent variables in the UTAUT model – effort expectancy, facilitating conditions, performance expectancy, and social influence – on health professionals' intention to use the proposed mHealth solution. These validated insights will be leveraged for our proposed efforts to provide a sustainable mHealth infrastructure across disparate systems. The eHealth Innovation and Research center's eHealth Lab Ethiopia (www.eHealthLab.org ), at the University of Gondar, will be an extension of our research team. It is recognized as FMOH's center of excellence for health information system education and research. The focus of eHealth Lab is to support multi-disciplinary research, development and evaluation of eHealth solutions which includes public health efforts for immunizations, TB, and HIV care. There are currently 14 faculty, three PhD and nine masters level students who are studying health information system at the University of Gondar, to expand Ethiopia's capacity to support mHealth and as a sustainability strategy in the future. 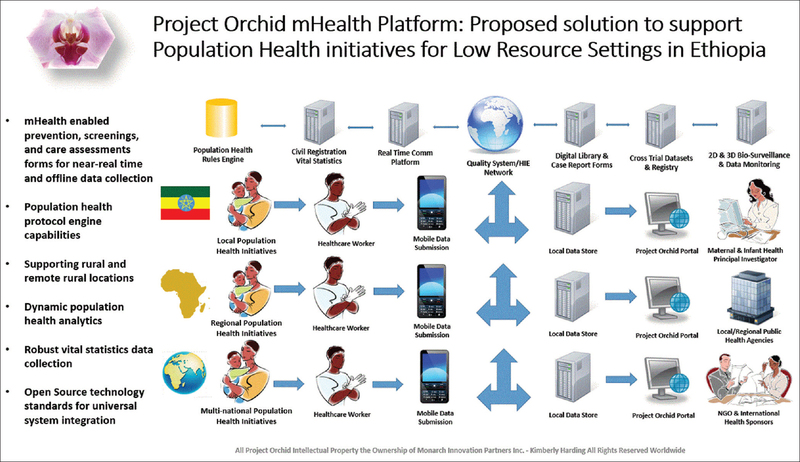 The proposed Project Orchid mHealth platform and implementation approach that we have detailed in this paper, can support the progressive vision that Ethiopia has for mHealth adoption across the country. This proposed effort will address the need for technology enabled population health surveillance, digitized screenings and patient follow-up efforts for controlling infectious and chronic diseases. In addition, the outcome of adopting these methods will enable health-care workers based in local villages, regional health-care facilities that support national public health surveillance efforts, a more reliable method of health information management than the dual data collection process that they currently use. The scope of this effort will be the first of its kind in Ethiopia, demonstrating concurrent data collection and data exchange for multinational cancer research efforts and Ethiopia's partnership with AFCRN and their international research partners. The result of this level of innovation, will pave the wave for Ethiopia to leverage this platform across strategic public health initiatives and increase Ethiopia's capacity for collaborative clinical research globally. This work was supported by National Institutes of Health grant R01HL132344 (T.B.M). WHO. MHealth New Horizons for Health through Horizon. Available from: http://www.who.int/goe/publications/goe_mhealth_web.pdf. [Last accessed on 2015 May 28]. Brinkel J, Krämer A, Krumkamp R, May J, Fobil J. Mobile phone-based mHealth approaches for public health surveillance in sub-Saharan Africa: A systematic review. Int J Environ Res Public Health 2014;11:11559-82. Using Electronic Technology to Improve Clinical Care – Results from a before-after Cluster Trial to Evaluate Assessment and Classification of Sick Children According to Integrated Management of Childhood Illness (IMCI) Protocol in Tanzania. Available from: http://www.biomedcentral.com/1472-6947/13/95. [Last accessed on 2015 May 28]. Mitchell M, Hedt B, Msellemu D, Mkaka M, Lesh N; Improvement in Integrated Management of Childhood Illness. Implementation through use of mobile technology: Evidence from a pilot study in Tanzania. BMC Med Inform Decis Mak 2013;13:95. Available from: http://www.biomedcentral.com/1472-6947/13/95. [Last accessed on 2018 May 18]. Mitchell M, Getchell M, Nkaka M, Msellemu D, Van Esch J, Hedt-Gauthier B, et al. Perceived improvement in integrated management of childhood illness implementation through use of mobile technology: Qualitative evidence from a pilot study in Tanzania. J Health Commun 2012;17 Suppl 1:118-27. Mangilma J, DeRenzi B, Lyons J, Mrema B, Ollis S, Schaefer W, et al. CommCare: A phone-based tool for home-based care in Tanzania. Second International Conference on Mobiles for Development, Kampala, Uganda; November, 2010. Mhila G, DeRenzi B, Mushi C, Wakabi T, Steele M, Roos D, et al. Using mobile applications for community-based social support for chronic patients. Helina; April, 2009. World Health Organization. Global Health Observatory (GHO) data [Ref. list]. Available from: http://www.whoint/gho. [Last accessed on 2017 Nov 10]. WHO. Management of Patient Information: Trends and Challenges in Member States: Based on Findings of the Second Global Survey on eHealth, eHealth Series v6; 2012. Available from: http://www.apps.who.int/iris/bitstream/10665/76794/1/9789241504645_eng.pdf. [Last accessed on 2015 May 28]. WHO. Health Statistics 2014; 2014. Available from: http://www.apps.who.int/iris/bitstream/10665/112738/1/9789240692671_eng.pdf. [Last accessed on 2015 May 28]. WHO. Report of the Commission on Intellectual Property Rights, Innovation and Public Health 2006; 2006. Available from: http://www.who.int/intellectualproperty/documents/thereport/CIPIHReport23032006.pdf. [Last accessed on 2015 May 28]. Hoy R, Rubin J, Mitchell M. Using Mobile Technology to Address the 'Three Delays' to Reduce Maternal Mortality in Zanzibar. International Journal of User-Driven Healthcare, 2014.
International Federation of Pharmaceutical Manufacturers Association. The Pharmaceutical Innovation Platform, Sustaining Better Health for Patients Worldwide, IFPMA; October, 2004. Available from: http://www.who.int/intellectualproperty/Pharmaceutical_innovation.pdf. [Last accessed on 2017 Nov 10]. World Cancer Research Fund International 2012 Report, Cervical Cancer Statistics; 2018. Available from: https://www.wcrf.org/int/cancer-facts-figures/data-specific-cancers/cervical-cancer-statistics. [Last accessed on 2018 Apr 15]. Bruni L, Barrionuevo-Rosas L, Albero G, Serrano B, Mena M, Gómez D, et al. Human Papillomavirus and Related Diseases in Ethiopia. Summary Report. ICO Information Centre on HPV and Cancer (HPV Information Centre); 27 July, 2017. Available from: http://www.hpvcentre.net/statistics/reports/ETH.pdf. [Last accessed on 2017 Feb 20]. Abate SM. Trends of cervical cancer in Ethiopia. Cervical Cancer 2015;1:103. Edelstein M, Pitchforth E, Asres G, Silverman M, Kulkarni N. Awareness of health effects of cooking smoke among women in the Gondar region of Ethiopia: A pilot survey. BMC Int Health Hum Rights 2008;8:10. American Cancer Society. Cervical Cancer Causes, Risk Factors, and Prevention. 01 November, 2017. Available from: https://www.cancer.org/content/dam/CRC/PDF/Public/8600.00.pdf. [Last accessed on 2018 Aug 01]. Ministry of Finance and Economic Development: Federal Democratic Republic of Ethiopia Growth and Transformation Plan 2010/11–2014/15. Volume 1. Addis A baba; November, 2010. Central Statistical Agency, C.S.A.E. and Icf, Ethiopia Demographic and Health Survey 2016. CSA and ICF: Addis Ababa, Ethiopia; 2017. Consulting VW. mHealth in Ethiopia Strategies for a New Framework; 2011. Serkalem J, Demeke A, Rahel B. Mobile Health Application in Ethiopia: Existing Initiatives and Practices; 2013. Medhanyie AA, Moser A, Spigt M, Yebyo H, Little A, Dinant G, et al. Mobile health data collection at primary health care in Ethiopia: A feasible challenge. J Clin Epidemiol 2015;68:80-6. Bilal NK. Health extension workers in Ethiopia: improved access and coverage for the rural poor. In: Chuhan-Pole P, Angwafo M, editors. Yes Africa can: Success stories from a dynamic continent. Washington DC: The World Bank; 2011. p. 433-43. Medhanyie AA, Little A, Yebyo H, Spigt M, Tadesse K, Blanco R, et al. Health workers' experiences, barriers, preferences and motivating factors in using mHealth forms in Ethiopia. Hum Resour Health 2015;13:2. Akhlaq A, McKinstry B, Muhammad KB, Sheikh A. Barriers and facilitators to health information exchange in low- and middle-income country settings: A systematic review. Health Policy Plan 2016;31:1310-25. Aranda-Jan CB, Mohutsiwa-Dibe N, Loukanova S. Systematic review on what works, what does not work and why of implementation of mobile health (mHealth) projects in Africa. BMC Public Health 2014;14:188. World Health Organization, International Telecommunication Union. National eHealth Strategy Toolkit. Geneva: World Health Organization; 2012. GSMA. The Mobile Economy. Sub-Saharan Africa; 2017. The World Bank Group. Mobile Cellular Subscriptions (per 100 people); 2016. Ethiopia Mobile Cellular Subscriptions 2000-2016. Available from: https://www.statista.com/statistics/497217/number-of-mobile-cellular-subscriptions-in-ethiopia/. [Last accessed on 2018 May 18]. The Federal Ministry of Health. Health Sector Transformation Plan 2015/16-2019/20. Addis Ababa, Ethiopia; 2015. Jemberu S. Mobile Health Application in Ethiopia: Existing Initiatives and Practices; June, 2013. The Federal Ministry of Health. Ethiopian National eHealth Strategy; 2014. Adam L. What is happening in ICT in Ethiopia. A Supply and Demand Side Analysis of the ICT Sector; 2012. Pink Ribbon-Red Ribbon. Available from: http://www.pinkribbonredribbon.org/aninnovative-approach-to-screening-for-cervical-cancer-in-ethiopia/. [Last accessed on 2017 Nov 10]. The Open Group Architecture Framework 9.1 Enterprise Edition; 2011. Available from: https://www.opengroup.org/architecture/togaf9/downloads.htm. [Last accessed on 2015 May 28]. National Cancer Control Program. Available from: http://www.mathycancersoc.org/wp/?p=443. [Last accessed on 2017 Nov 16]. ACFRN – Addis Ababa City Cancer Registry. Available from: http://www.afcrn.org/membership/members/100-Addisababa. [Last accessed on 2017 Nov 16]. Harding K. Global health innovation models. J Nanobiomed 2016;3:7. EUnetHTA Joint Action 2, Work Package 8. HTA Core Model Version 2.0; 2013. Available from: http://www.corehta.info/BrowseModel.aspx. [Last accessed on 2015 May 28]. Health Technology Assessment of Medical Devices. (WHO Medical Device Technical Series) 2011; 2011. Available from: http://www.apps.who.int/medicinedocs/en/d/Js21560en/. [Last accessed on 2017 Nov 10]. WHO. Guidelines for Screening and Treatment of Precancerous Lesions for Cervical Cancer Prevention. Available from: https://www.guidelinecentral.com/summaries/who-guidelines-for-screening-and-treatment-ofprecancerous-lesions-for-cervical-cancer-prevention/#section-396. [Last accessed on 2017 Nov 15]. The Internet2 Technology Evaluation Center. Available from: https://www.itec.tamu.edu/. [Last accessed on 2015 May 28]. Success Stories Next-Generation 9-1-1. Available from: http://www.its.dot.gov/ng911/. [Last accessed on 2015 May 28]. NG9-1-1 ICE- Industry Collaboration Events. Available from: http://www.nena.org/?page=NG911_ICE. [Last accessed on 2015 May 28]. The Status of NG911 Development in the United States. Available from: http://www.theindustrycouncil.org/publications/iCERTReportontheStatusofNG911DeploymentintheUnitedStates.pdf. [Last accessed on 2015 May 28]. Session Initiation Protocol. Available from: https://www.datatracker.ietf.org/doc/rfc3261/. [Last accessed on 2015 May 28]. Session Initiation Protocol. Extension for Instant Messaging Status of this Memo. Available from: https://www.ietf.org/rfc/rfc3428.txt. [Last accessed on 2017 Nov 10]. Revised Civic Location Format for Presence Information Data Format Location Object PIDF-LO. Available from: https://www.ietf.org/rfc/rfc5139.txt. [Last accessed on 2015 May 28]. Session Description Protocol Status of this Memo; 10 November, 2017. Available from: https://tools.ietf.org/html/rfc4566. [Last accessed 2018 Aug 01]. Seethamraju R, Diatha KS, Garg S. Intention to use a mobile-based information technology solution for tuberculosis treatment monitoring – Applying a UTAUT model. Inf Syst Front 2018;20:163-81. Venkatesh V, Morris MG, Davis GB, Davis FD. User acceptance of information technology: Toward a unified view. MIS Q 2003;27:425-78.